Relax and enjoy the finest meal and service, at U.S. 41 and 30 in Schererville. Hours available: Lunch portion 11:00 a.m. to 4:00 p.m.; Dinner portion 11:00 a.m. to 9:00 p.m.
Not applicable with any other discounts, coupons or Holiday Dollars. 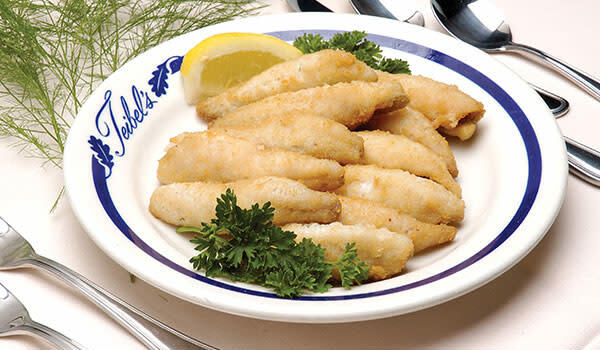 Teibel's boned and buttered Canadian Yellow Lake Perch (approx. 5 pieces for lunch portion, 10 pieces for dinner portion). Served with our homemade tartar sauce, melted butter and lemon. Traditionally lightly fried, however we can prepare our fish broiled, sautéed or gluten-free. Teibel's features: Come see our renovated Coffee Shop!